There’s no greater feeling of excitement than when you’re ‘walking right down the middle of Main Street, USA.’ There, after walking under the train station, you’ll get first official sighting of the Castle, catch a sweet smell from the Confectionary wafting through the air and maybe even have to step aside for a Trolley or two. Some guests like to make a beeline to rides and attractions right after rope drop – which is a great strategy! – however I can’t help but take my time and enjoy all the sights, sounds and smells of the street I wish I lived on! It’s no surprise that the Walt Disney Company pays attention to little things. From Hidden Mickeys in the parks and resorts to Easter Eggs in movies, Imagineers and Animators alike truly reward their fans for noticing the tiny details. One of the lesser known hidden gems for guests at Disney Parks are the cryptic tributes in the advertisements in each of the windows that line Main Street. I’ve walked up and down this Street many times and was shocked to find out how little I actually knew about this huge honor! 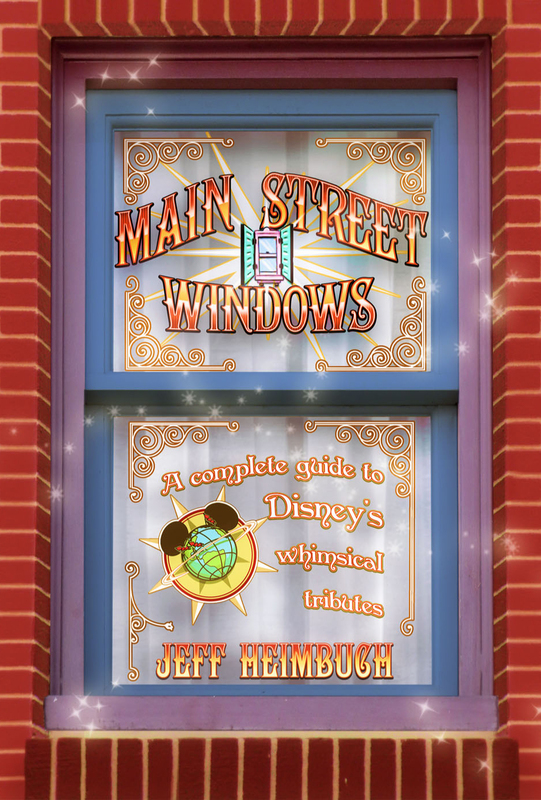 In his new book, Main Street Windows: A Complete Guide to Disney’s Whimsical Tributes, author Jeff Heimbuch takes us on tour of all the Main Street windows of Disneyland, Magic Kingdom, Tokyo Disneyland, Disneyland Paris and Hong Kong Disneyland. Much like Hidden Mickeys, Disney has not produced a full listing of the windows anywhere else in the world so Heimbuch’s gorgeous pictures and descriptions now serve as the official catalog. Each page features a full-color photograph of a window (or two) and a breakdown of the names featured and meaning behind it. Though most people are well aware that Disney pays attention to even the smallest of details the fact that almost every window pays tribute to someone that contributed something special to the Disney organization is incredible! The author goes on to illustrate the meaning behind this particular window, describing the career path of Ray Van De Warker. He started his tenure at Disney as summer help in 1955 and eventually became head of the Davy Crocket Explorer Canoes where he inadvertently helped start a yearly Disneyland tradition of Racing Around the Rivers of America. I love the humor behind these tributes and am sure the honorees are incredibly grateful for the acknowledgments. I can’t even being to think about all the time and effort Heimbuch spent in creating this guide. From obtaining stunning photographs of each and every window in all of the Magic Kingdom-esque parks to researching the details behind the advertisements, his hard work certainly has not gone unnoticed. Main Street Windows: A Complete Guide to Disney’s Whimsical Tributes is a great addition to any Disney fan’s library and I can’t wait to take it with me on my next trip to the Magic Kingdom to spot some of my new favorite features of Main Street, USA. Jennifer Vichko is a lifelong fan of all things Disney and is thrilled to be reliving the magic through the eyes of her one-year-old daughter. She resides in Pennsylvania with her Husband of 6 years where her hobbies include decorating, DIY and planning her family’s next Disney vacation.